Celebrity chef Paula Deen is in hot water this week because she’s admitted to using racist language in the past. Many are outraged. The Food Network has dropped her show. At least one of her sponsors has also bailed, Smithfield Foods. Others will likely follow. Her cookbooks publisher is on the fence, waiting to see if the winds shift in her favour. Paula Deen crying during her June 26, 2013, interview with Matt Lauer on NBC’s The Today Show. No one can condone what she said. Specifically, she’s admitted to using the “N” word on a number of occasions, but she says she’s not racist. Some former employees claim they’ve been mistreated because of their race, while others have leapt to her defence, including African-American friends who know her personally. Meanwhile, she’s made two videos apologizing for her language and asking for forgiveness. This week, she’ll also be appearing on NBC’s The Today Show after missing an earlier scheduled interview. While I can’t predict what she’ll say, her friends at The Today Show will likely ask some tough questions for which she’d better have some good answers. She’ll likely ask for forgiveness again. Before this most recent controversy, critics were also being hard on Ms. Deen for the recipes she put forward in her magazine, cookbooks and cooking shows. They say her food is unhealthy and she should know better, especially after admitting to being recently diagnosed with diabetes. On that particular point, I say it’s a free world. Her recipes are clearly not made for eating day in and day out or you’ll find yourself having the wall of your bedroom being cut out by firefighters as they attempt to get a crane into your bedroom to get you out of your house. While her recipes aren’t exactly health food, a treat now and then won’t hurt you. And if you can’t control yourself, then stay away from her recipes. Pretty simple, if you ask me. Now, in all this hubbub over her choice of language and the anger it has caused from the public and critics — and the angry reaction of fans toward The Food Network for cancelling her show — one thing has gotten lost in all of this. The woman has asked for forgiveness. I believe her when she says she’s sorry. I truly do. I know media critics have gone nuts over how bad her first video was (I didn’t see that one), but I did see the second apology video and can tell you that at least in my opinion it was downright pitiful, especially if you’re a Paula Deen fan like me. I’ve watched her for years and can’t imagine her having a mean bone in her body. Sure, the inappropriate language is not acceptable, but from the African-Americans who’ve been in the media who are friends of hers, they’re defending her. I give a lot credence to that. If there were hordes of people coming out of the woodwork screaming, “Well, it’s about time!” then I may not be so forgiving. But I have a really hard time not forgiving someone who sincerely asks for my forgiveness. Unless they have done something so heinous toward me, I would hope that I would forgive them. 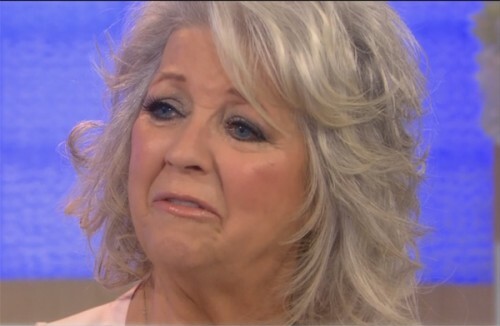 I consider myself a pretty good judge of character, and I just don’t see Paula Deen as some sort of racist monster. I just don’t. Maybe I’m being naïve. Maybe she’s got some Jekyll-and-Hyde thing going on, but I doubt it. When I see her smile and listen to that southern drawl, I just don’t see or hear the cruelty, fear and ignorance of a racist. I know that many times when someone I know personally or a celebrity does something questionable, I’ll often say, “I always thought there was something ‘off’ about them. My intuition was right!” But not with Paula Deen. Didn’t see that one coming. I believe her when she’s says she’s sorry. I really do. Now, many out there may think I’m nuts to give her a break, but let me assure you that likely every one of us would be in her position if everything we’d said in the past would be put in the media for others to judge. Words that are out of context. Words that were said before we evolved and matured. Words that were said out of anger or fear. As for me, I’m pretty sure people would be crossing the street to avoid me if some of the stuff I’ve said in the past would be put to public judgment. I have a raunchy and politically incorrect sense of humour. Among a select group of close friends, I like to shock people by saying inappropriate things for the sake of humour — and we all laugh. But trust me, if someone recorded what I say and put it out there and out of context, you’d probably rather hang out with Adolf Hitler than me. Of course, if we offend, we must apologize and we must ask for forgiveness, right? Right. But if that’s the case, shouldn’t we also have some sense of obligation to accept that apology and give the person another chance? Are we really going to throw someone’s career to the crocodiles over one word used in the past — a word they admit was wrong and a word for which they’ve apologized? My hope for Paula Deen is that she has the strength to weather this storm of controversy. It won’t be easy. My hope for those who are bashing her over the head for this even though she’s begged for forgiveness is that you find a shred of decency in your hearts to give her a second chance. After all, you may be the one asking for forgiveness one day after something you’ve said or done. And we all have to do that at some point. Thanks to Radio-Canada’s decision to retreat from its recent rebranding decision to drop Radio-Canada from its brand in favour of just Ici (French for “here”) I now have nothing to write about. Or do I? Let’s at least take a stab at it. You see, I was going to write this long rant about how it was a horrible idea. Removing Radio-Canada from the French-language national broadcaster’s branding didn’t make any sense to me. In fact, it smacked of a sneaky political agenda undertaken by Quebec nationalists at head office in Montreal who would like nothing better than to see the word Canada disappear from the broadcaster’s branding. It was a brilliant tactic, really. What better way than to make Canada even more remote from people’s minds in Quebec than to remove it from a part of everyone’s daily life in the province? Get rid of that pesky Canada word that people hear a dozen times per day and their ties to the country will weaken even further than they already have. Before I go on, let me point out that I’m an avid fan of public broadcasting, including CBC and Radio-Canada. If it were up to me, budget cuts there would be a thing of the past. I’m all in favour of more government support. We’re a huge country bordering on three oceans. Many of our citizens live in remote areas. If it weren’t for public broadcasting, they’d be even more isolated than they already are. And no, trying unsuccessfully to watch television on a dial-up Internet connection isn’t a substitute. Unfortunately for those who decided to rebrand Radio-Canada when no rebranding was necessary, they forgot about francophones outside Quebec who quite liked hearing, seeing and reading the term Radio-Canada. They didn’t wince. They didn’t feel like throwing up. They didn’t feel like burning a flag. They didn’t feel like separating from the country. They felt connected to the country. They felt pride. I could almost imagine Pauline Marois, the separatist premier of Quebec, wringing her hands and cackling with evil glee as one more symbol of Canada fell to the wayside in her province. What better way to soften the province’s attachment to Canada even more than by removing the constant barrage of positive branding via Radio-Canada. I’m not normally a conspiracy theorist, but this practically sounds like an evil plot. Now that this ill-advised branding experiment has been abandoned, heads will most certainly roll among those who cooked up the absurd idea of removing the country’s name from the country’s national broadcaster. What’s next? 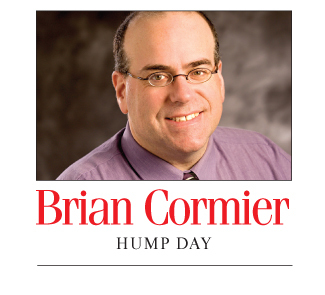 Rebranding New Brunswick as Ici – Chicken Fricot? Prince Edward Island as Ici – Red Dirt? The United States as Ici – Guns? I grew up watching Radio-Canada. Hearing “Ici Radio-Canada” was comforting. I knew people in British Columbia, Newfoundland and Labrador, and the Northwest Territories were hearing the same thing. Of course, I mostly watched the kids’ shows. There was Fanfreluche, La Souris Verte, La Ribouldingue, Grujot et Délicat, and Sol et Gobelet. And at suppertime, it was always Bobino. I can still whistle the opening theme. The emotional attachment to a solid national brand should not be underestimated. Generations of Canadians have grown up with the Canadian Broadcasting Corporation (affectionately known by drunk people as the Canadian Broadcorping Castration) and Radio-Canada. As children, we watched Mr. Dressup, Chez Hélène, The Friendly Giant. And what about The Beachcombers? Don Messer’s Jubilee? Hockey Night in Canada? Wayne and Shuster? Royal Canadian Air Farce? What I’m saying here is that there is a very strong and positive emotional attachment to public broadcasting in this country. Can you imagine the BBC in the U.K. removing “British” from their branding? It would be unthinkable. Had the geniuses at Radio-Canada’s head office in Montreal seen fit, they would have probably renamed the BBC as BB Ici or perhaps Ici – Haggis. Don’t get me wrong. There are a slew of organizations that are in terrible and desperate need of rebranding. But Radio-Canada isn’t one of them. And they certainly didn’t do it, at least in my own humble opinion, for the right reasons. Now, we’ll all read about how this backtracking is a great idea and something they’d planned on doing all along. Sure., they never intended to blah blah blah. They were never going to blah blah blah. What would be refreshing and I sincerely hope we hear it, is that they just admit they made a big mistake and move on. Radio-Canada’s “Ici” was well on its way to becoming another branding disaster like New Coke or Pepsi Clear, horrible mistakes made by those who believed that those strong iconic brands were broken. Radio-Canada executives can at least find solace in the fact that francophone (and I daresay anglophone) Canadians have a deep attachment to their brand. Many corporate executives in the world would love to have that problem. What you thought was broken proved not to be. You can be grateful for that. ‘Tis the season for twice-weekly lawn mowing, flower planting and landscaping. Thankfully, though, I have someone else doing this all for me as I have a son who enjoys this type of stuff. He’s pretty good at it, too! The front and back yards are starting to look like a botanical garden compared to what they used to. My house’s previous owner was quite the gardener and kept the flowerbeds well kept. Unfortunately, when I bought the house, the flowerbeds were left untended except for my next door neighbour who took pity on them. The poor plants wept for joy whenever they saw her coming. These days, though, are spent running around garden centres for bags of soil and various plants and trees to spruce up the property. What was done last summer is looking pretty good, actually, so I can’t wait until next summer when everything blooms and the trees start to show some growth. I’ve never really been a gardener. I like nice landscaping as much as the next guy, but if the yard relied on me to look nice, well, let’s just say it would be waiting a long time. I’d rather pay someone else to do it — or in the current case offer someone free rent to do it! Either way works for me. What’s pretty astounding this year are the number of poppies. If you have poppies, you’ll no doubt know that the number of seeds they drop is quite significant. A couple of years ago, I think I only had two or three and I think those seeds blew in from somewhere else. If you haven’t seen poppies other than the plastic ones worn on lapels around Remembrance Day, mine seem to be quite a bit larger and more orange than red, really. They’re tall, lanky and quite delicate. A heavy rain can really do a nasty job on them, so it’s best to photograph them when you can. Speaking of which, I really need to invest in a special camera lens for close-up photos. I see bees and ladybugs on these new flowers around the property and it would be great to capture some of the photo opportunities I see passing me by. Maybe before that, though, I should actually invest in photography lessons so that I’d know how to use my camera. It has so many bells on whistles on it that my ‘don’t read the instructions’ life mantra is really not serving me well. Basically, all I do now is put it on the automatic setting, point, shoot and hope for the best. I paid enough for the camera, so you’d think I’d be bright enough to invest in some training on how to properly use it to its full capability. Oh well, in my experience, I just tell people that I’m taking “five or six” photos and make it sound like I know what I’m doing. In reality, I’m just playing the odds. Out of those five or six, I just pray that one of them come out less blurry than the others. I recently posted a photo of my dog Milane on Facebook. It was a really cute photo taken right after her latest grooming. I got lots of compliments online about how she looked so cute. She did in that particular photo, one out of about 50 I took during that session that didn’t make it look like she was abused, 30 years old (for a dog, that’s old!) or deformed in one way or another. That’s my secret: Take 20 and post one. One of those suckers is bound to turn out half decent! During summer, I do enjoy the rustling sound of the trees, I have to admit. It’s so relaxing. This time of year, too, the air is filled with the scent of lilac trees. My next door neighbour has a large lilac tree and the aroma that comes from it is really nice. So summery! When I take Milane out late at night for her last “business trip” of the day, the quiet street and empty park are perfect for listening to the leaves rustling in the wind and for taking a whiff of that hypnotic real lilac aroma – something that chemicals in air fresheners and detergents just can’t replicate. The splash pad is on in the park now and doesn’t seem to ever shut off. That, too, is another sound in the neighbourhood when I take the dog out late at night before bed. The splashing water on the splash pad’s concrete will remain largely undisturbed until the kids return the next day to spend hours running in and out of the water laughing. Early mornings are great, too. The quietness never lasts until the local street traffic starts, the transit buses start running and the traffic on the nearby thoroughfares starts to create the humming sound that will go largely unnoticed as the day passes — once you get used to it. It’s kind of like white noise at this point. You don’t even know it’s there until you hear the odd tractor trailer, revving motorcycle or siren from an ambulance, police cruiser or fire truck. I don’t have a deck on the back of my house, but I may just have to invest in one someday. Instead of being stuck inside the office working, I could at least be sitting on a screened-in deck as I work away. Since I work from home, I might as well take advantage of the situation. Hmmm… I wonder if I could write off the deck construction on my taxes? Probably not, but I’m willing to risk it. Is prison food any good these days? Surely, I can pick a better reason for going to jail than taxes. Maybe with all those poppies growing in my back yard, I could start producing opium. And from that opium, maybe I could just start producing heroin. Oooh, I could buy some cool plants from the garden centre with that kind of money, couldn’t I? See? Gardening has already turned me into a drug addicted dope dealer. I knew there was a reason I didn’t garden.